Open Data . . . Redefining transparency in Douglas County. By leveraging public data as a strategic community asset and providing it as a service, Douglas County is building solutions to make government data accessible, useful and personally relevant to the citizens and businesses in Douglas County. This is a wonderful program that will allow each of us to obtain answers to your questions in a quick manner and it helps the efficiency of Douglas County employees. 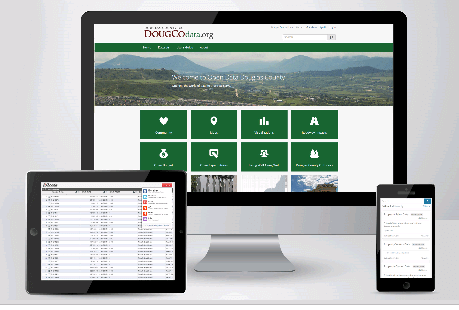 Now, you have the answers (and more) at your fingertips and Douglas County employees to concentrate on their jobs. What is Open Data and Why Does it Matter? This innovative approach to governance and transparency is rapidly being adopted by organizations around the world and across all levels of government. Open data is the idea that non-personal public information should be readily available to those to whom it belongs –our citizens. Open data, especially open government data, is a tremendous resource to both individuals and organizations. Other benefits include improved measurement of policies, greater citizen participation, and with clear and consistent reporting, enhanced accountability. Open Data Initiative Guidelines have been developed to assure compliance with Colorado Revised Statutes governing protected information. What is protected from public access today will continue to be protected. The Guidelines will be published on the open data webpage. The first phase of this initiative will publish information geared to our senior population. Currently there is not a single public repository of resources for seniors and their families, and we seek to create a single source for this growing demographic in our community. Another component of phase one is to publish Assessor and Treasurer data sets. This will begin our efforts to remove the existing barriers between Assessor and Treasurer data that currently prevent efficient consumption of this highly correlated information. Phase two will include Douglas County financial data, as well as Douglas County planning, building and engineering information. Additional partnerships and opportunities will be pursued in subsequent phases. This is the beginning of a great journey for Douglas County! To better understand and prioritize the data needs of our constituents, we seek to engage both citizens and the business community with an advisory board and focus groups. Broad-based community input is critical to the long term viability of this initiative. Douglas County makes no representations or warranty as to the completeness, accuracy, timeliness, or content of any data made available through this site. Douglas County expressly disclaims all warranties, whether express or implied, including any implied warranties of merchantability, or fitness for a particular purpose. There may be an occasional need to change data format or schema as the data is modified and/or updates the data are completed. It is understood that the information contained in the site is being used at one’s own risk. Nothing stated herein is intended to be, or should be interpreted as, a waiver of the Governmental Immunity Act, §§ 24-10-101 to 120, C.R.S.